Lemuria is the hottest romantic place these days (saying this with conviction) and I’m glad to share this word-of-mouth secret with you. Of course, we don’t want this place to be too crowded (would we?) because it would lose its mysticism and the fact that it can only accommodate 20+ people. Anyhow, we still have time to enjoy the secret a little longer since this place has been operational for only two months. I’ve searched this in google and I’ve never seen a decent review of this urban hideaway in the Metro. Thanks to Ponch for sharing this. It is owned by Marina Bru Schroeder also known as Kitt who decided to convert her convenient office space for Brumms Quality Wines, Inc. into a cozy and romantic restaurant. She makes it a point to talk to each and every one of the customers dining during that night. It is located in the winery compound owned by the Aboitiz family in Horseshoe Village. It sits on top of one of the biggest wine cellars I’ve seen in the metro containing an extensive variety of wines filled up to 1/3 of its holding capacity of 27,000+ wines. Her German husband, Klaus Schroeder was kind enough to give us a tour of the cellar which houses german, romanian and austrian wines among others. It serves mediterranean cuisine cooked by Chef Golda-May Ranada who is ex Beluga and Le Souffle Chef ( that is all I know and I was hoping some of you would know more). I was hoping to talk to Chef Golda to give my compliments and to know more about her but unfortunately I was not able to do so. It was almost a year ago when we celebrated Popsy’s birthday in Chef Humphrey Navarro’s P45 (see French Fine Dining @ Parallel 45) which just opened during that time. I have a theory that every year there will be a secret cozy place that would open up and we won’t run out of these secret hideaways. So, it is now becoming a tradition in the family to make it a point to eat in a nice place during Popsy’s birthday, with this year’s celebration held in Lemuria last Aug. 5. Before you read on further, it is important that you know the Legend of the Lost Continent of Lemuria. It is said that one of the reasons why Philippines is a center of supernatural phenomenon is because it is part of the lost continent of Lemuria. Marina Schroeder was fascinated about this legend and hence the name Lemuria. I’m glad the Klaus was kind enough to show us around this huge refrigerated cellar. Prahova Valley Romanian Red Wine is Lemuria’s house red wine which would come in three varieties: cabernet sauvignon, merlot, and pinot noir. This reisling wine comes in as highly recommended by Klaus – Gunderloch Reisling 2003. Thanks Klaus for the tour :)! Prahova Valley Cabernet Sauvignon 2000 (P530++). You got to try these romanian red wines and I’m not a wine connoisseur (yet) but I like the way the wine stimulates your appetite. Walnut and Focaccia Bread with Sun Dried Tomato (FREE). I find the Walnut bread very unique and together with sun dried tomato it becomes a perfect appetizer to start off your meal. I like the walnut because of its unique texture and the walnut bits. Seared Foie Gras, Braised Cabbage Salad and Fig Glaze (P620++). The Foie Gras was cooked very well — juicy, soft and without that malansa taste. Although, I regret to order this since it is the most expensive appetizer and at some point you will feel the calories after a few spoonful of this. Also, the braised cabbage salad did not go very well with the foie gras. Poached Sea Bass and Braised Fennel (P860++). This was a big disappointment. 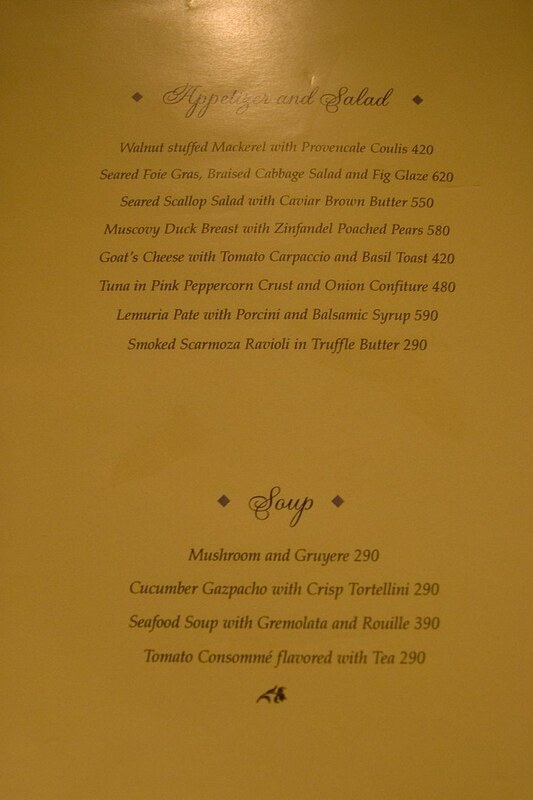 For P1,000+, the sea bass tasted like the ones served in ordinary restaurant. The seabass was not melting in your mouth and in fact it was semi-hard which tasted like the frozen seabass mass cooked haphazardly. I want to get my money back for this dish and I do hope that this does not happen to anybody else. Braised Lamb Shank, Apricot and Red Wine Sauce (P720++). For some reason, it was just OK. I guess it is because the tender meat was not as tasty as we expected it to be. It feels like the meat was not marinated very well so eating the lamb shank felt eating a chunk of meat. All Items are subject to 12% and 10% service charge. Creamy Carabao’s Milk Panacotta (P180). The creamy gelatin like carabao milk was done very well. It has the right amount of sweetness and milky taste complimented by the fruit bits surrounding it. German Chocolate Egg with Toy inside (FREE for kids). Kitt gave my son this wonderful chocolate egg surprise which the we ended up eating anyway and Aidan just got the toy inside. Directions: Coming from Edsa, take ortigas avenue past the greenhills area and Santolan intersection. Go straight and turn right on N. Domingo st. Then turn right into horseshoe village. Since it is shaped like a horseshoe, you have to take the left road because the right road is a one way street. Just go straight until you reach the bridge. After the bridge, you will already see a sign of the winery on your left at the first corner. I am beginning to suspiciously think that Le Souffle chefs don’t know how to cook Sea Bass. My benchmark pa naman for a pricey fine dining resto is “if they know how to cook sea bass”. If they kill a fine fish (well, i think we can say that it’s like the diamond of all fishes no? ), the failure is UNFORGIVABLE. and may i add that the food there, for us, is great! i wud love to hear wat you will have to say about it. u’v got a nice food blog here…more power! hi! i just wanna ask what camera you’re using 🙂 thanks! Because of you, I saw the place. One should be prepared to spend at least P 2,000 for a full course. Steps not too friendly though for the oldies. We had an interesting dinner at Lemuria, hits and misses but overall a positive experience. First the bad: the walnut bread was a bit too sweet for me; someone ordered the scallops in a salad and found it to be (like your seabass) not fresh; and my order of the twice cooked pork belly was not as tender as I had hoped (I was expecting it to melt in my mouth) plus the risotto was poorly cooked. The good: the foie gras was excellent, the seafood chowder was also well received, and our desserts were all great (we had nearly every single dessert except for the sorbet which was not available). Hosts were very likeable too. 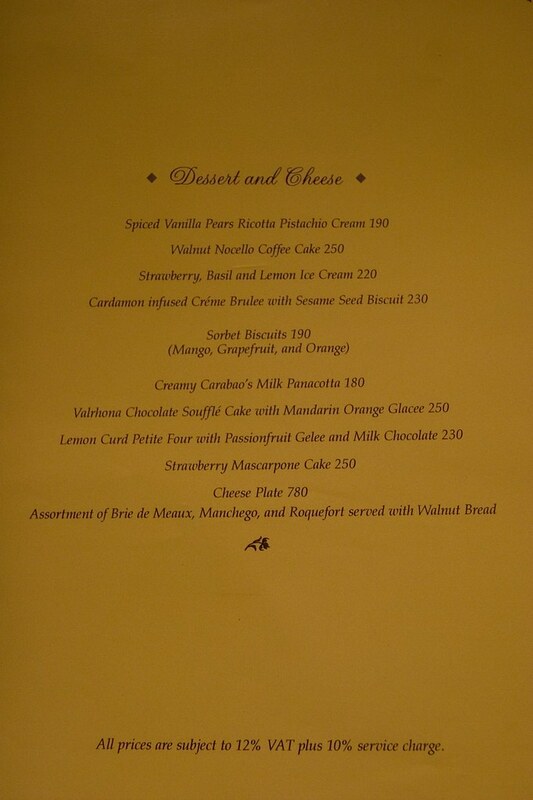 Had planned a nice romantic dinner with my boyfriend tonight at Lemuria, a restaurant highly recommended by my sister. Service was excellent as the servers were attentive, professional, and courteous. The ambiance was also quite quaint and impressive for its simple elegance. The series of disappointments started from the very beginning- even before I started to order. After a short browse of their menu, I realized that the posted menu on their website is no longer up to date. I have been checking out the sites and the forums to anticipate what to get but unfortunately almost everything on their website is no longer available as they change their menu every 3 months. The next disappointment was the food that we ordered. I had ordered the lamb shank and my boyfriend had ordered the pork with risotto. Both were not worth their price tags as they were very ordinary and quite common in taste. Their sauces for the meat were also very insipid. I certainly hope that we had just ordered the wrong stuff but nonetheless with price tags like that, everything should be good, if not excellent. My girlfriend and I celebrated our anniversary there by dinner a few days ago. I ordered the pork belly with risotto and she had the tiger prawns with scallops. The pork belly was nothing extraordinary. The tiger prawns with scallops was more of a food for the eye than food for the stomach; 2 prawns and 2 scallops for 880++. 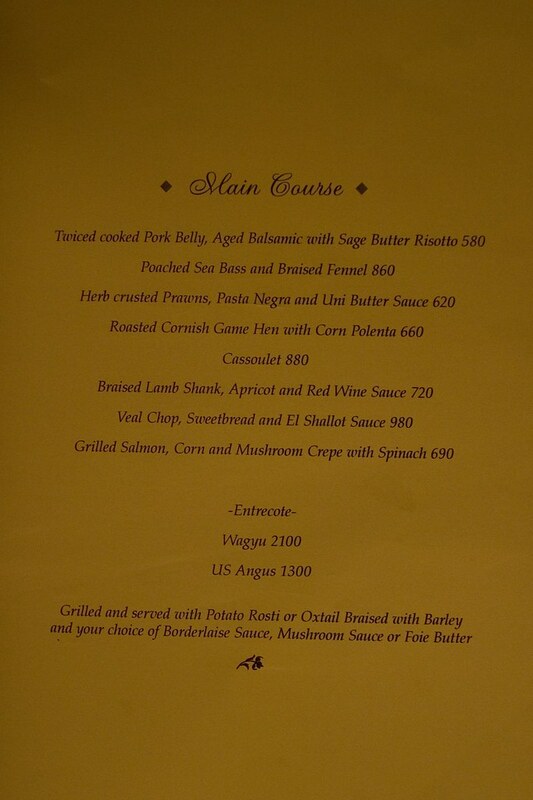 I don’t think the food gave justice to the prices; it’s overpriced for the taste. After eating, my girlfriend and I thought we would’ve enjoyed the food better if we ordered a whole chicken each at Yahoo grill in Metrowalk for foodtrip or had dinner at a 5-star hotel than this. On the other hand, at least, we thought Lemuria had nice ambiance and good service.